At my daughter’s school, they have themes for each day of Teacher Appreciation Week. And as room mom, it is my job to take that theme and celebrate our teacher. It is a fun challenge, and I am love coming up with teacher gift ideas for my daughter’s wonderful teacher. 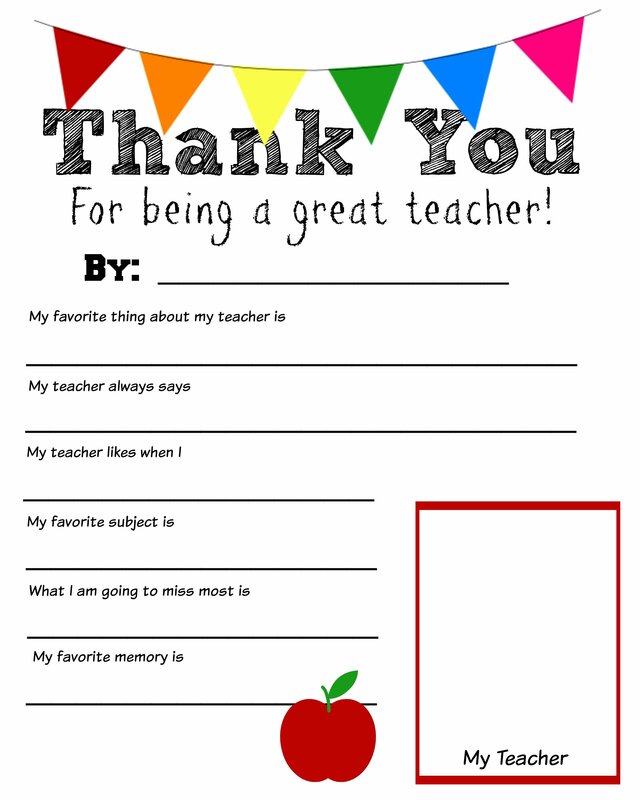 My favorite so far is the Thank You Teacher Free Printable I created for the kids to fill out. It would also make a great end of the school year teacher gift too. To start the week of strong I decided on two projects for students’ sentiments. The first, a framed photo of the class with autographs from all of the kids. Putting it together was easy. I requested time in class last week and had each of the children visit me in the planning room to autograph the mat. Then I added names of all of the kids and the year to a picture I took on the class field trip (text on image edited for privacy), and created a simple but meaningful gift from the students. The frame I used is no longer available, but this white frame with a large square matt is perfect. I also wanted something that showed the students. As first graders, this year has been a big year for beginning to learn creative writing, so I wanted to show off everything they learned. So borrowing an idea from a mom with an older student, I created a Thank You Teacher worksheet. Using open-ended questions for the students to answer, I emailed a copy to all of the parents in the asking them to return it completed. Oh my gosh, I am LOVING the answers I am getting back. So much personality. Once I have received all of the completed worksheets, I am going to put them in a folder and present them to the teacher with the framed gift. A perfect way to show the teacher how much her students care! To download the free printable, click the link below. You do not need to install anything to download. Please note any banner ads with pictures that say download are not the printable. The only place to download is the link below. Download your Thank You Teacher Free Printable. To download, click the link above. It will open in another window, then right-click on it to save it to your desktop. Once it is saved to your computer, you can print it. This is delightful and so meaningful. Pinned! Stopping by from Treasure Box Tuesday. Very cute ideas! Love the thank you card! So cute! Glad you were able to make use of the printable, I am sure your teacher loved it! This is really cute! I’m going to print the Thank You note. My daughter will enjoy filling it out. Thank you! I found your post at Inspire Me Monday. Lots of great gift ideas. Thanks for partying with us at Idea Box! See ya back next week! I love these! Especially the thank you teacher worksheet, the kids answers are always hilarious. I will definitely be pinning this for end of the year teacher gifts. Thanks for sharing! This is such an adorable idea! Thanks for sharing on Wake Up Wednesday Linky Party. I love the printable! Such a cute idea for an end of year gift too! I have a few friends that are teachers. Things like this mean so very much to them. They work really hard, and deal with a lot of silliness (from the kids and the political side). Being thanked, by the people they care for the most, is very rewarding. Thank you so much for sharing this printable! I’m not sure why I spent time getting another teacher gift ready….this totally stole the show! And rightfully so! My son is only three, so I had to write down what he said and changed the questions just a bit, so he would understand them, but his answers were so cute. This is priceless. Thank you! Sorry! Will never visit again. You requirement to download useless software BEFORE being able to get the free download is ridiculous. For the record, you don’t have to download anything – nothing. The printable is a jpeg, just save it to your computer and print. I don’t ask anyone to download anything, ever. Scroll to the bottom of the post (before “More thank you teacher gift ideas”) and click the link that says, “Download your Thank You Teacher Free Printable.” That will open a jpeg in another window, save and print. That’s it. I love this teacher worksheet! Just wish it didn’t repeat the question about a favorite memory. I still plan on printing it out and using it. If you print it out you will see the questions are different. I did it slightly different for my daughter’s class. Came it be edited when it is downloaded? I notice ‘my favorite memory’ is on there twice and I would like to change it to something else. are we able to personalise it at all or is it all one graphic ? Thanks Jen! It is a single graphic, so it is not editable. Although the download is slightly different than the one in the image. The only personalization is your child’s notes 🙂 Enjoy. Hello! I love your free printable idea! I’m am trying to print it and for some reason the font is extra extra large and it’s printing on three pages… wondering how I can get it to print on one page like the one shown on your site. Anyone else have problems like this? How did you fix it? Thank you! How do you suggest presenting all the kids completed forms to the teacher? Did you laminate each page? Put it into a photo album? Put it in a 3 ring binder or folder of some sort? This will be a gift from each student in the class to the teachers. Thanks! I had the kids return the pages to me, then I used 3-hole punch to punch holes in them and placed them in a simple paper folder with prongs. I made a cover page and the kids presented it to the teacher. A binder would work, but the paper folder was nice since it is a typical school supply, it felt very appropriate. Have fun with it! Awesome in 2017!! Thank you!! I’m so glad I found your awesome printables! My “non-artsy” four-year-old LOVED drawing a picture of her teacher in the little box and answering my questions to complete for teacher appreciation week. Thank you, again! I am so glad you guys had fun with it!!! Thank you for the free teacher appreciation template! We personalized it with our teachers name! So cute. Thanks again!! I love all of your ideas! So creative. Thanks again! Awe! Glad you liked it. How can you personalize it before printing? Do you need Adobe software for that? Hello, would there be any way for me to print this in a larger size without using Word (I don’t have that). My son writes large and it prints fairly small at least not as large as the ones in your examples. Either way thanks for a cute idea! The printable doesn’t use Word. It is a jpeg. To print it, click on the link to open the image in another window. Then right click the image to save it to your computer. From your computer, print the file. Be sure you select fit to page so it fills the whole page. You won’t be able to print it any larger than that, but that should give your son plenty of room even if he writes over some of the text. Enjoy!